Dean Mosher’s murals rendered for the state’s bicentennial will remain in place at the Eastern Shore Art Center (401 Oak Ave., Fairhope) for another month. The painter created nine of them and a pair — “Battle of Fort Mims” and “Tribute to the Merchant Marine in World War II” — have delighted crowds throughout January. The murals are sponsored by the Alabama Tourism Department, the Alabama Community Service Grant Program and the Baldwin County Legislative Delegation. Also there is “Magic City Shines,” a group exhibit of Birmingham artists including Eric Johnson, David Joseph Self, Chiharu Roach and Dan Bynum. Pottery by John Rezner will join the aforementioned exhibits. The gallery is open Tuesday through Saturday, 10 a.m. to 4 p.m. 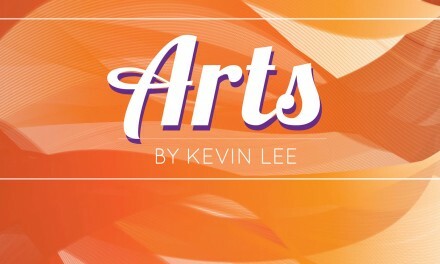 Call 251-928-2828 or go to esartcenter.org. Former Dunbar Magnet Middle School student Catherine Chung has won a Distinguished Honorable Mention Award for her film submission to the 2018 Ocean Awareness Contest, sponsored by Bow Seat Ocean Awareness Programs. Selected from nearly 1,000 Junior Division entries from around the world, Chung received a $100 cash scholarship. The contest invited students to explore climate change impacts through visual art, film, music, poetry or prose. Chung’s film submission, “Chasing Change,” is a three plus-minute documentary focusing on pressures on Pacific Islands populations, changes in energy production and lifestyles. Bow Seat created the Ocean Awareness Contest in 2012 to teach teenagers about issues facing local waterways and global oceans, to empower advocacy for these places and create positive change. Each year the contest invites students to explore our roles as both problem-makers and problem-solvers through the creative arts. To view Chung’s winning submission, visit bowseat.org/gallery/chasing-change/. When an Appalachian family bluegrass band is tardy to a Depression-era Baptist church, it starts an unraveling of religious tabu and social graces that bestow manna from the heavens in the form of laughter. It’s all part of “Smoke on the Mountain,” the hilarious musical staged by Chickasaw Civic Theatre through Feb. 3. The show is “pert’ near bustin’” with American roots music, familiar traditionals such as “I’ll Fly Away,” “The Church In the Wildwood” and “Angel Band.” In a show of versatility, the cast contains many familiar names from Mobile Opera, including Thomas Rowell, Scott and Sarah Wright, and director Stacey Driskell. Showtimes for the final weekend are 7:30 p.m. for the Friday and Saturday shows, 2 p.m for the Sunday matinee. Tickets cost $18.75, $15.75 for student/military/seniors/children.